As I write this, I am sitting in a Southern Tradition, a Waffle House restaurant. I’ve got the place to myself and that won’t last long at this time in the morning, it does have me thinking about family and Christmases past. This collage of seemingly unrelated items seems a potent touchstone of my personal history. There is the tree in the middle, its got a few presents but its there. 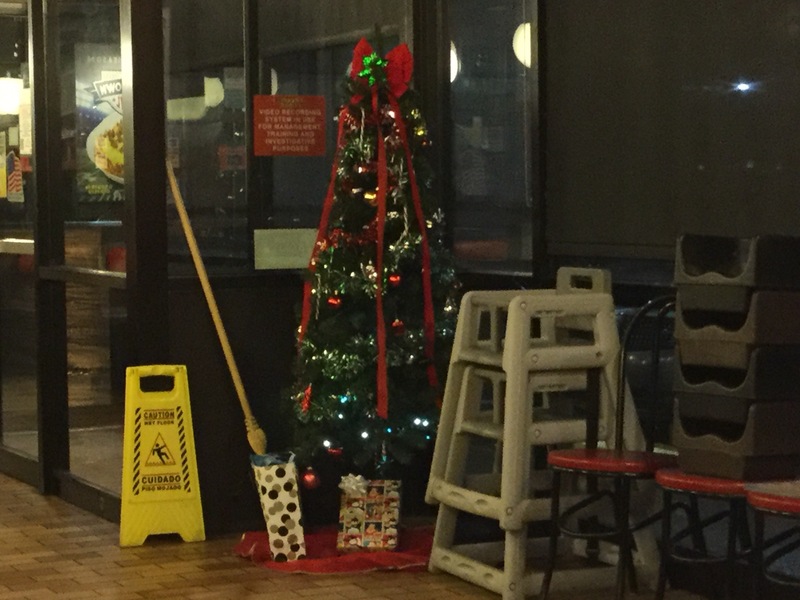 The broom in the background, reminds me that before the tree went up, we always spent a long time cleaning. My childhood home was comfortable, but we were not exactly austere with our belongings (that means things were cluttered). So after putting away all the extra things and cleaning up we could put up the tree and place the presents around it. Often enough we pushed furniture out of the way to erect the tree too. One of the Christmas traditions we had back then was a lovely one. Dad would take the four of us to a local Target store, give each of us a little money (usually $20 or $30) and told us we had to buy three gifts with that money for everyone else in the family. The he would sit in the cafe and give us an hour to wade through the shoppers and shop for our family. These were ‘token’ gifts, White Elephant type gifts, nothing expensive (we weren’t given much) and so it was an exercise in looking through all the things that hadn’t yet sold, sifting the wheat from the chafe as it were. And it was always so much fun… Ok, thats the rose-colored glasses of nostalgia talking. Dodging last minute shoppers and seeing all of the things not quite in our budgets that we couldn’t get and looking for something that would work within what we had. Smart man my dad. Dad’s been gone now fifteen and a half years and this family tradition ended when I left home, but I still think about it often enough to remind me that even in the hustle and bustle of everyday life, family can have a lasting positive impact on one’s life. I always felt like the childhood I had was a privileged one (though by no means what you would consider so) as I had a childhood rich with experiences not things. I miss my father, but keep a little of him still alive within me. So as you weave about the last minute items on your list, dodging the crazy parents trying to bribe their children’s love with the latest ‘must have’ toy, remember, that no matter how much you don’t give your kids, remember to give them what really matters.